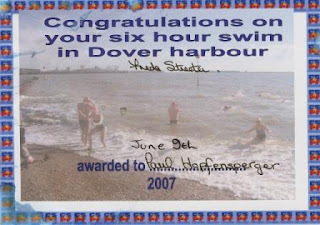 www.HoffySwims.com: Hoffy qualifies for the Channel with a 19.6KM, 6 hour swim! 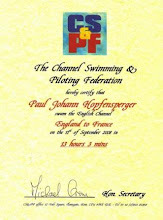 Hoffy qualifies for the Channel with a 19.6KM, 6 hour swim! Above & below : Ecstatic after emerging from the channel after 6 shoulder numbing hours and qualifying to swim the channel. Even though I had completed 5 hours in the channel the previous Sunday, I had beaten myself up all week thinking that I had mentally failed the previous week. I was determined not to mentally fail this week. All week I had been thinking "6 hours on Saturday". "6 hours on Saturday...". However, I have found that if you just get in the harbour and think about just swimming 6 hours, you will probably fail. You need to break it down into smaller steps. In my case, I know that swimming from swimmers beach to the Eastern dock (770 Metres), 4 times back and forward across the harbour (4,600 Metres) then back to swimmers beach (770 Metres) = 6,140 Metres = 2 Hrs. That's all I think about for the first two hours. After two hours, it's in for a feed, ask Cliff [Golding] "How long now?". "1 hour then in for a feed" he replies. To me that means swimmers beach to the Eastern dock (770 Metres), 2 times back and forward across the harbour (2,300 Metres) then back to swimmers beach (770 Metres) = 3,840 Metres = 1 Hr. and so it goes on. 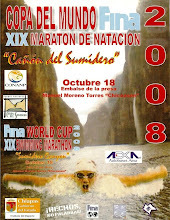 Before you know it, by breaking it down into little chunks, you have swum for 6 hours, and completed 19,625 Metres. A new personal best! However, there are small hickups. Today, the sun was beating down, and the water really was a nice temperature (14.1 degrees centigrade). Swimming at one stage from the Easter Docks to Prince of Wales Pier, I remember thinking "Today is a great day to be alive!". The sea was dead calm, the sun was out and the breathing was bilateral and superb, no problems. "1,2,3 breath left". "1,2,3 breath right". "1,2,3 breath left". Right the way across the harbour. 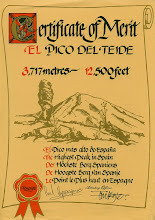 1,150 Metres! No problems, no tumble turns like in the pool, no stops, I was in my element, in total control, not cold, the sun was out, it was beautiful! Swimming back towards the Eastern Dock, I felt a quick pain shoot up my left arm starting at my thumb and finishing near my armpit. It worried me. "Was this a heart attack?" was my first thoughts. But I felt alright. It was probably nothing. Then I felt similar things all over various areas of my body. Little pains like which felt like running through stinger nettles or something. It was really weird but not too painful so I carried on. At the last feed on hour 5, Cliff gave us our feed (a hot Maxim and half a banana). "Well done Hoffy" he said "only another hour". He is always full of encouragement, and he was right. All of a sudden, I was the past 5 hour mark with only an hour to go. I headed off towards the Eastern Dock. My shoulders were really painful, but all I could think about was that I was going to do my 6 hours qualifying swim, and breaking it down into small segments like I had, it didn't seem nearly as far as the previous week's 3.5 hour or 5 hour swims. I swum the last hour, then as I looked at my watch with about 200 Metres to go, it said 5 Hrs. 58 minutes. I reached the shore and stood up at 6 Hrs. 02 Minutes and screamed "YYYeeeessss!". I had done it. 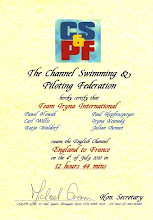 I had qualified for the channel, and it was easier than the previous two weeks swims, because I had mentally prepared myself for it all week. I walked out. I wasn't even cold or hungry. I was chuffed to bits. 19.625Km in 6 Hrs. 02 minutesand I had qualified for the channel. 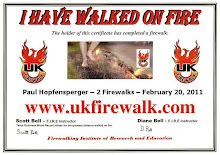 I walked up to Freda who congratulated me, then gave me a certificate (see below). I had no idea we would get a certificate! This was a great day. 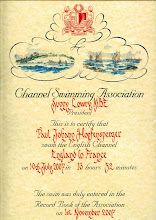 Above: 6 Hours certificate signed by Freda, The General, to confirm that I was now qualified to swim The Channel (it's a bit smudged because I got it wet on the day in the excitement). After a few minutes, Beccy asked me if I had seen all the Jellyfish in the harbour. "No" I replied. She told me there had been loads of them, especially to the left of where I was feeding. She said that lots of people had been stung. It was then that I realised that my "Heart attack" had been a Jelly fish sting! Well, I had experienced it all now, and it really wasn't that bad. Nothing was. This really had been a great day! Brilliant Paul, The blog is really good, the best I have found anyway, Am looking forward to Sundays account, you must have a great mental confidence now that the time has rocketed up to 6 hours, I bet you are counting the days, well hope you are eating and resting well in your month leading upto the big day, be sure to keep me posted. YOU CAN DO IT BIG MAN!! 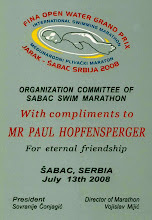 Mark, thanks for the comments and the un-ending e-mail enthusiasm for the blog and the swim training. It helps to know that someone is going throught it with me! Best wishes, Hoffy. Well done Paul. Six hours swimming!! Better a jelly fish than a heart attack. I've never had a jelly fish sting - but I once got hit round the ear by a fish leaping out of the water and that really stung!! Keep it up, not long to go! Thanks Ruby. I've never been hit by a flying fish but am sure there will be a first time! Beccy just reminded me we saw some in Paxos a few years back. It sounds painful. But not as painful as my shoulders. I have bearely slept since Saturday night due to the pain! 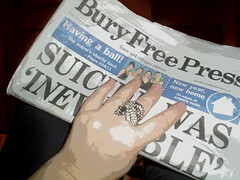 It is excrutiating and I am on a diet of Guiness, White White, Paracetamol and Ibuprofen to heal the pain. I am just about to float off to be now because I am in the pool at Culford at 7am tomorrow! Far out man! Float...float...float..